Each photon of the light that has a high enough energy to be absorbed by the crystal's atoms will set free an electron hole pair. The electron and hole are free to move through the lattice in a Brownian motion ; however, on average they will never move too far from each other. When the electron comes too close to a hole during their Brownian motion, they will recombine. On the other hand, when they experience an electric field, this will tend to separate the electrons from the holes; the electrons will drift toward the positive pole (the anode), and the positively charged holes will drift toward the cathode. Recombination will then take place in the external circuit (within the electric wires). Consequently a current will flow. Since it is generated by photons, one speaks of a photo current. And the semiconductor that performs this effect is called a photo conductor. Photo conductors are passive devices. They react to light by changing their electric conductivity. In order to activate them an external electric power source, such as a battery, needs to be supplied to draw a current that increases with increasing light intensity. There are many photo conductor devices in our surroundings; as for example, in cameras, in streetlight controls to switch the lights off at dawn and on at dusk, or for light barriers in garage door safety controls. 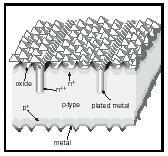 Such a built-in field is easily created in certain semiconductors that can dissolve a small quantity of different impurities; can donate a free electron, called a donor; and can also accept an additional electron, called an acceptor. When dissolving these impurities (called doping) separately in different parts of the crystal, the region that contains donors is called the n -type region, the region with acceptors is called the p -type region. Between these two regions lies an np junction. This region represents the built-in field, since the n -type region is negatively charged compared to the p -type region. Here electrons that are created by light can be separated from the accompanying holes, with the electrons moving into the attracting p -type region and the holes moving preferably into the n -type region. 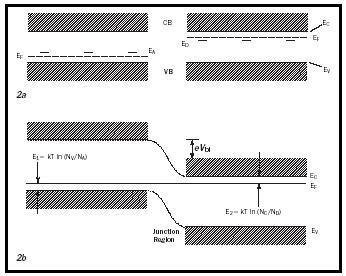 with the determining Fermi level E F , in the n -type region lying essentially in the middle between the donor level and the lower edge of the conduction band, E c . N c is the effective density of states at the lower edge of the conduction band and is on the order of 10 19 cm −3 . A similar equation holds for the density of holes; here the Fermi level lies between the acceptor level and the upper edge of the valence band (see Figure 2a). In thermodynamic equilibrium the Fermi level is horizontal throughout the crystal, thereby forcing both conduction and valence bands to bend, creating the pn -junction (see Figure 2b). Electrons from the p -type region will thereby "roll down" the hill and holes from the n -type region will "bubble up" the slope; hence both will be separated until their charge will force a reduction potential barrier so that the thermal motion across the junction will become equal from the left and from the right. Figure 2a. Band picture with conduction band (CB) and valence band (VB) in an n - and a p -type region with the Fermi level E F identified, which usually lies close to the donor-( E D ) or acceptor level ( E A ) respectively. Figure 2b. A pn junction when both regions are joined resulting in the junction region with a barrier height of eV b ; of the built-in electric field. Figure 3. A pn junction with light, showing the quasi-Fermi levels and their connection to the electrodes, with V the applied voltage and V bi the built-in voltage. Close to the metal surface enhanced surface recombination will cause both quasi-Fermi levels to collapse. Figure 4. Current-voltage characteristics. Dark current (dashed) and photo current (solid); (the shift from the dark current is shown j L ) indicating open circuit voltage and short circuit current. The inscribed maximum rectangle represents the maximum power point voltage and current. with ν oc = V oc /( kT / e ). The actual fill factor is usually somewhat smaller and is a measure of the quality of the solar cell. It is a function of the diode doping and of solar cell materials. The net carrier transport in a solar cell can be pictured as shown in figure 5, with light ( hν ) coming from the left and generating (g 0 ) electron hole pairs in the p -type front layer (of thickness d ). The electrons move towards and through the junction, the holes in opposite direction. When both are shown as electron current (the arrow head is inverted for holes) one visualizes the continuity of the carrier flow and its building up with increasing depth of the front layer. Typical representatives of this class of homojunction semiconductors are Si; several III-V compounds, most prominently GaAs; and from the class of II-VI compounds CdTe, since it can be doped p - and n -type, while others cannot. Several ternary compounds are also used, most prominently CuInSe 2 and similar ternaries. 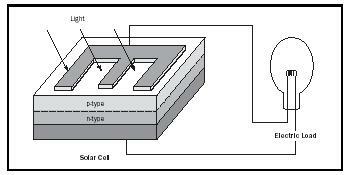 An example for a heterojunction cell is the CdS/CdTe combination (Meyers and Birkmire, 1995). For more details see Green (2001). Other factors that influence the output of solar cells are degradation of surfaces and of electrodes; the first causes a reduction of carrier lifetime, the second causes a reduction in solar cell life expectancies. An example of the first is the beneficial effect of a natural oxide layer that reduces surface recombination of Si solar cells, while special efforts need to be made for GaAs cells to passivate the surface. 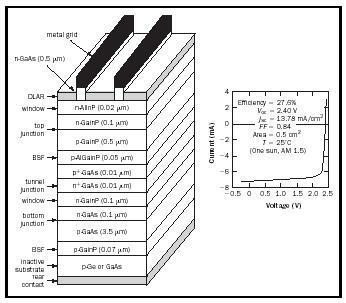 An example for the second effect is the CdTe solar cell, which has difficulties maintaining stable electrodes on the p -type side. Chung, B. C; Virshup, G. F.; and Schultz, J. C. (2000). Proceedings of the 21st IEEE Photovolt. Spec. Conf . Kissimee, FL, p. 179. Gee, J. M.; and Virshup, G. F. (1988). Proceedings of the 20th IEEE Photovol. Spec. Conf . Las Vegas, NV, p. 754.